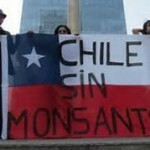 Monsanto loses against indigent Chilean Farmer. In contrast to the United States, Monsanto is not viewed favorably by the legal system in other countries where groundbreaking litigation has curbed the trend to steam roller over farmers. 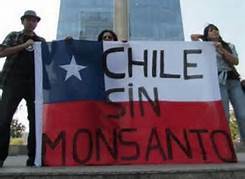 A Chilean farmer has achieved the seemingly improbable and has won a CLP$ 37 million lawsuit against Monsanto for breach of contract. The coordinator for Chile’s Pesticide action network learned about the farmer’s experience in September 2013. “This farmer did not know exactly what he was planting, he had no idea what a GMO seed was; the contract stated a fantasy name, Mon49 maize. He was compelled to an intensive use of more than 10 hazardous pesticides, harmful for health and the environment. The contract he signed forced him to turn only to the Chamber of Commerce in case of disagreement, he could not file lawsuits in local courts. He explained to us that many producers also have had problems with Monsanto, but they don´t turn to the Chamber because it is too expensive,” said María Elena Rozas, coordinator for Red de Acción en Plaguicidas(Pesticide Action Network) RAP-Chile. The judgment was affirmed by the Court of Appeal who rejected Monsanto’s appeal.The judgment was entered by Judge Francisco Gazmuri Schleyer, a Chamber of Commerce arbitration judge, in case 1385-11 “Agrícola Pizarro Ltda. con Agrícola Nacional S.A.C”, who found that ANASAC/Monsanto failed to comply with its obligation “which consists in providing services of technical supervision of the sowing in a dilligent manner and giving strict compliance to the manufacturer´s instructions for Monsanto´s seed”. The farmer received the payout at the end of December but claims it is not enough to compensate for the damages that he has suffered as he lost his house, his crop spraying machine, a tractor, his pick-up truck and his wife left him. In addition he was in debt to Banco Santander, a local bank, to the tune of CLP$90 million after growing Monsanto´s GMO maize in Melipilla for ANASAC. He has been placed on the transnational black list as a result of the lawsuit. “What happened to this farmer may be an example for hundreds of small farmers, seduced by big earnings and fair treatment promises by corporations which export GMO seeds. But the profit is real only at the beginning. The great majority of the defrauded do not report and make themselves dependent on what the corporation offers, which becomes less every day. And there are not many alternatives for farmers, due to the lack of rural public policies or incentives that effectively favor agroecologic production. We must change this,” said María Elena Rozas. ← Plant compound found in fruits and vegetables stops memory loss associated with Alzheimer’s.